Last weekend I went to the mall in attempt to find some jeans that are not skinny jeans and I realized that OH MY GOSH it’s pretty much summer. (Side note: can they please start making jeans that are not skinny jeans again? Because some of us have chunky calves. Thanks.) The air was thick and humid and it was hot out. Not hot hot, because it gets way hotter here, but hot enough that I knew that all the alternating warm-and-cold days of spring were over and now it’s just going to get hotter and hotter until it finally starts to cool down again in the fall. So now that it’s feeling like summer, I think it’s time to start putting some summer recipes on the blog. I decided last summer that cold noodle salads were my most favorite summertime food. Then I remembered: oh, corn. Corn is my favorite summertime food. Duh. But cold noodle salads are a close second! The veggies make them feel light, but the noodles make them more substantive than a regular salad. And they’re cold, which is always welcome on a hot day. This is one of those fun salads where you can put out all the ingredients and let everyone fill their bowls to their liking. You can either make the tofu right before serving, so it will be warm, or make it ahead of time, refrigerate it, and put it into the salad cold. With a half teaspoon of red pepper flakes, the dressing is spicy, making it the perfect pairing for cool cucumbers, noodles, and ribbons of carrot. 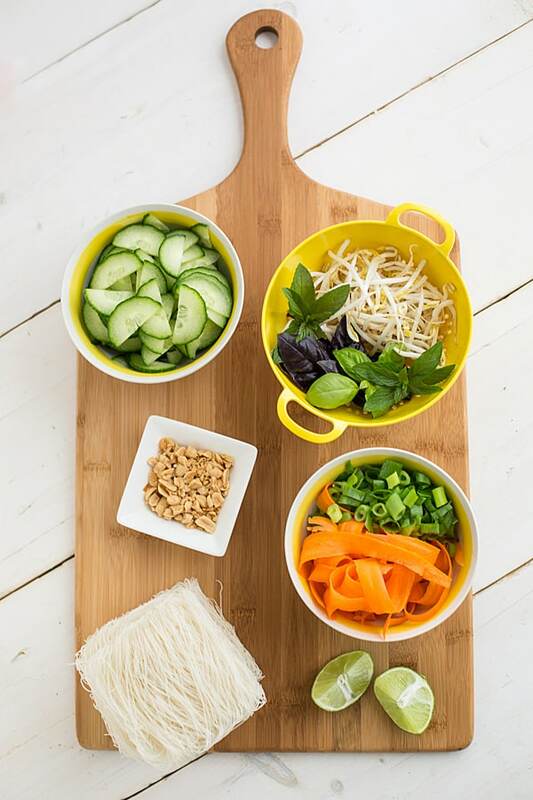 A spicy summer noodle salad adapted from Martha Stewart’s Thai Chicken and Noodle Salad. Place tofu and half of dressing in resealable bag or bowl. Toss to coat and marinate for 30 minutes. Heat oil in a large skillet over medium heat. Add tofu and cook about 4 minutes, or until browned. Remove from heat and set aside. 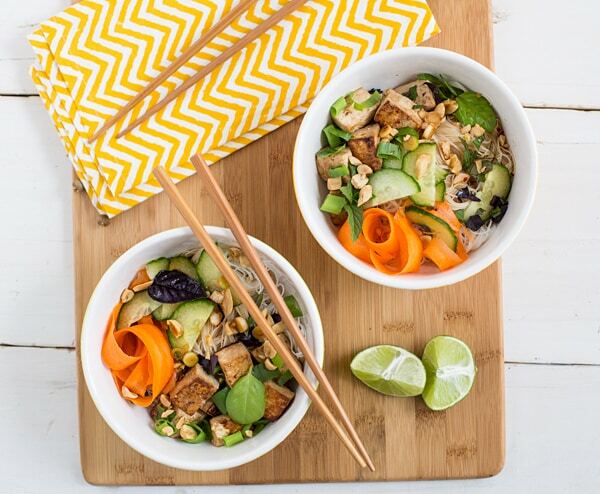 Divide noodles, tofu, carrots, and basil into four bowls. Top with remaining ingredients, as desired. Ladle dressing into bowls and serve. love the carrot ribbon idea! great for eating with the noodles. Adore this salad. And you know, I’ve never really made anything like it. But I’m totally there once warm weather hits. I rarely make cold pasta salads, but this is a genius idea to really lighten things up for summer! Buzzfeed linked to this recipe – it looks amazing and I am glad to find this blog! Thank you. This is a fantastic recipe and has become a part of our regular rotation! So yummy! Thanks for your comment – I’m glad you enjoyed it! I just made this delicious meal for dinner tonight. Absolutely scrumptious, simple and fresh, my family couldn’t stop raving about it. Will definitely be adding this to our regular dinner list! Thank you for your comment – I’m so glad you enjoyed it! I’ve been looking for recipes that both my pescatarian husband and I can enjoy. I’m going to try this with tofu for him and chicken for me.